What does 'stage' mean in git? I find git hard to understand as I could not find the meaning of the words used for the actions. I have checked the dictionary for the meaning of 'stage' and none of the meanings were related to source control concepts. What does 'stage' mean in the context of git? To stage a file is simply to prepare it finely for a commit. Git, with its index allows you to commit only certain parts of the changes you've done since the last commit. Say you're working on two features - one is finished, and one still needs some work done. You'd like to make a commit and go home (5 o'clock, finally!) but wouldn't like to commit the parts of the second feature, which is not done yet. You stage the parts you know belong to the first feature, and commit. Now your commit is your project with the first feature done, while the second is still in work-in-progress in your working directory. Since everyone so far has answered it the "formal" way, let me do this with alternatives to enhance learning with the power of metaphors. Staging is a step before the commit process in git. That is, a commit in git is performed in two steps: staging and actual commit. As long as a changeset is in the staging area, git allows you to edit it as you like (replace staged files with other versions of staged files, remove changes from staging, etc.). Consider a scenario where you call the movers to get your stuff from your old appartment to your new appartment. Before you do that, you will go through your stuff, decide what you take with you and what you throw away, pack it in bags and leave it in the main hallway. The movers simply come, get the (already packed) bags from the hallway and transport them. In this example, everything until the movers get your stuff, is staging: you decide what goes where, how to pack it and so on (e.g. you may decide that half your stuff will be thrown away before the movers even get there - that's part of staging). The commit in git is implemented transactionally, after the staging is sucessfull. Several steps in the staging can fail (for example, you need to commit, but your HDD is 99.9999% full, and git has no space to perform a commit). This will fail in staging (your repository will not be corrupted by a partial commit) and the staging process doesn't affect your commit history (it doesn't corrupt your repository in case of an error). To stage a file is to prepare it for a commit. Because git exposes this action to the users control it allows you to create partial commits, or to modify a file, stage it, modify it again, and only commit or revert to the original modification. Staging allows you finer control over exactly how you want to approach version control. I checked the dictionary for the meaning of stage and none of the meanings was related to source control concepts. The name "staging" for the git feature derives from this meaning: When staging, you are preparing and organizing a commit. Of course a commit is not quite the same as a performance, but it is an important event in a VCS :-). With most other version control systems, there’s 2 places to store data: your working copy (the folders/files that you’re currently using) and the datastore (where the version control decides how to pack and store your changes). In Git there’s a third option: the staging area (or index). It’s basically a loading dock where you get to determine what changes get shipped away. The "stage" is a technically required intermediate step in the process of checking in a file, namely collecting the changes to be added to the repository. Git's authors chose to make this step visible and persistent where other VCS make it a transient part of the commit process. So it's just an option that git gives you because it can so why not? The way I see it, the main thing the git "stage" gives you that other VCS don't is that you can use it to checkpoint a file. It's effectively an unnamed, uncommented local commit that gives you an intermediate step between being done with all your work and committing it to the repository permanently and having nothing saved in your local repo at all. For example, let's say you have a feature partially finished. It's in a stable state, passes all the tests, and could go into production, but you have more work to do on it. You could stage all your changes and then continue to work on the feature. Later, you'll have the option to just commit what you staged (and push that commit to the remote repository) or to add your new changes to your staging area and then commit that all at once, or to undo just your new changes and revert your working directory to the state it was in when you staged your changes. It's completely possible to practically skip the staging area altogether and just use the -a option to git commit if you don't find the staging area a helpful concept. Lots of people skip staging and GUI tools usually allow for this, too. done with step 1 stage it. done with step 2 , now step 1 and step 2 both are correct stage it. same way once you done with all 5 steps that means feature is complete now perform commit. 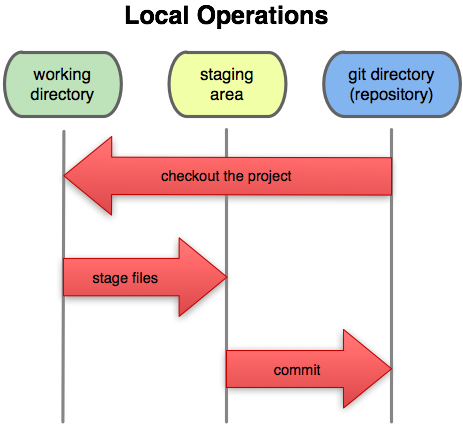 What is the benefit of git's two-stage commit process (staging)? Should Git be used for documentation and project management? Should the code be in a separate repository? Which DVCS (git or hg) is easier for programming students? Automatically update copyright date range from git? Why does git allow you to “change history”? What to do about large svn history when moving to git? Why does everyone use Git in a centralized manner?